But trying to force those feels away does the exact same thing. Trying to force yourself to not feel something is a fool’s errand. All that happens is you spend a lot of your time and mental bandwidth trying to tamp everything down. So not only is it still at the forefront of your mind, but all you’ve done is put the contents under pressure, because emotions don’t squeeze into a convenient little ball. All that happens is that they start to leak out through the cracks, leaving you even more aware of those feelings. And the more you try to patch those cracks and push your feelings down, the more you guarantee that it’s all going to burst out messily and all over the place. So instead, you just need to do nothing. Don’t try to not feel them. Don’t worry about them. Don’t think about what to do with them. Just let them be. When you feel those giddy feelings start to bubble up, note them and name them—“oh, right, that’s my crush on wozizname”—then let them just flow over you and around you and past you without touching you. On New Year’s Eve, my wife of nearly 10 years asked for a divorce. The reasons are complex and did not arise from an apparent offense on my part like infidelity (basically, she felt we grew apart). The papers are finalized and I’ve moved into a new apartment (and, here’s my Geek Cred–my first act as a new bachelor was to buy a Playstation 4). 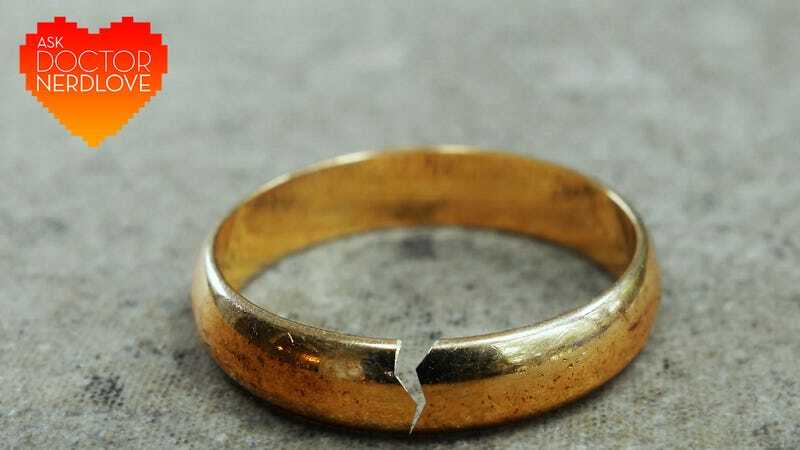 Granted, the divorce is very new to us and a transition is understandable–but, does this sound like a typical divorce situation to you? My ex-wife seems to rely on me as she always had. And, while a part of me wants to be angry and move away from her as much as possible, I care too much for her to create conflict where it does not need to be. The truth, Doc, is that I remain very much in love with her and hope that this continued “normalcy” will lead to a reconciliation in our marriage–if not now, then maybe a year down the line. It’s true that we grew apart in ways and our relationship has changed–it’s to be expected after two kids and stressful careers. And while the “sparks” may no longer remain–the trust and care we’ve developed for each other is the very definition of love. As the Fiddler on The Roof song goes: If that’s not Love, what is? I went on a lot of really solid dates with this girl and we really seemed to have a connection. We talked several times a day for over a month, exchanging and screenshotting each other’s selfies, and had some deep conversations about our lives and what we wanted out of them. On our first date we went to a restaurant and ended up talking for 4 hours and didn’t realize we’d done it until the restaurant was closed. We’ve been having a blast. But the thing you need to consider is that this may not be the whole truth. Not that she’s lying—not about liking you, or about her life being in a place where she can’t really date—but that she will try to pick things back up when and if everything changes. It’s certainly possible that, when circumstances change, she’ll circle around and the two of you can pick back up where you left off. But I wouldn’t count on that, and I wouldn’t go out of my way to try to stay at the forefront of her mind. Right now, the best thing you can do is follow her lead and take her behavior as a sign of how she means to go on. If she stays in touch—sending the occasional “what’s up” text or meme—then by all means, keep the conversation going. Ask Dr. NerdLove: How Do I Dump My Annoying Friend? Ask Dr. NerdLove: Should I Tell My Wife I&apos;m Having An Affair?